If love and romance is in the air try these pretty pink scented meringues. They are delicious with some freshly whipped cream. Rose water is a love of hate ingredient so it’s up to you if you want to serve these on Valentines Day. Weigh just the whites of 3 organic free-range eggs. 1. Beat the egg whites and the salt until stiff. You’ll need a hand mixer or a table top mixer is ever better. 2. Beat the sugar in a teaspoon at a time. The mixture should be firm and light. 4. Pipe tiny meringues onto a baking sheet lined with parchment. 5. Place in a preheated oven gas mark 2 and turn the oven off. 6. 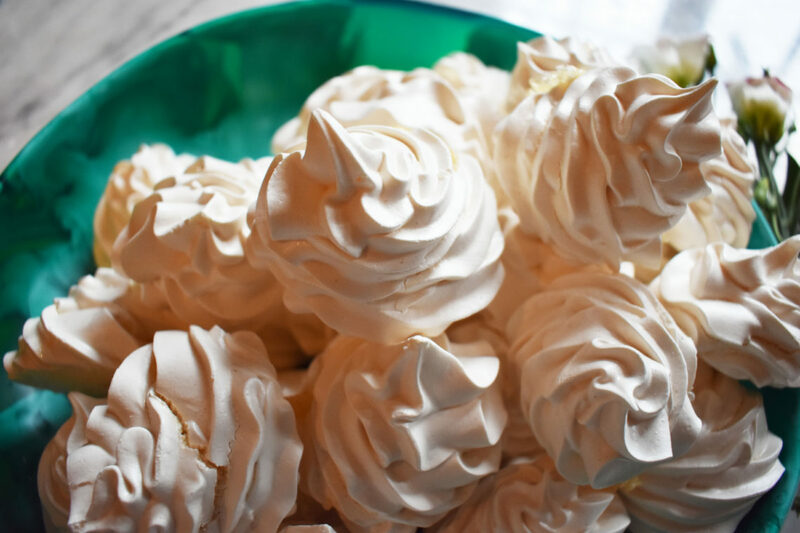 Leave in the oven for 1 1/2 hour if you like them chewy or over night if you like the meringues dry.